No mixing dough or cookie cutters needed for these bunnies. 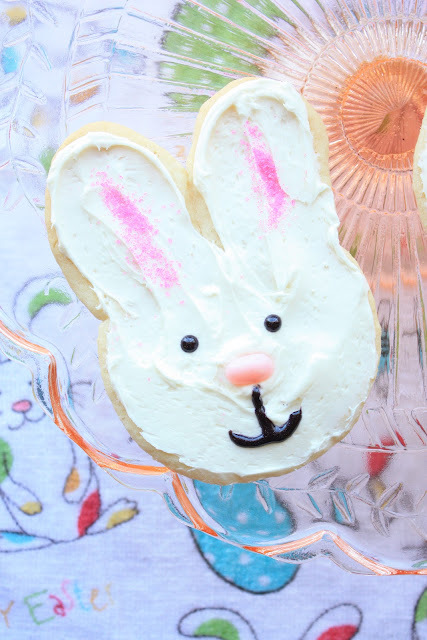 Just slice up refrigerated sugar cookies, spread on icing and decorate with supplies you may already have on hand, and voila~bunny cookies! The bunny is made from two slices of the prepared dough: one for the head, and one sliced in half for the ears. That's it! I picked up the frosting when I was grocery shopping, but already had everything else: pink sugar, black gel, and jelly beans. This is an easy, tasty treat to make with the munchkins. Heat oven to 350°F. Cut cookie dough into 16 slices; cut 8 of the slices in half down the center. 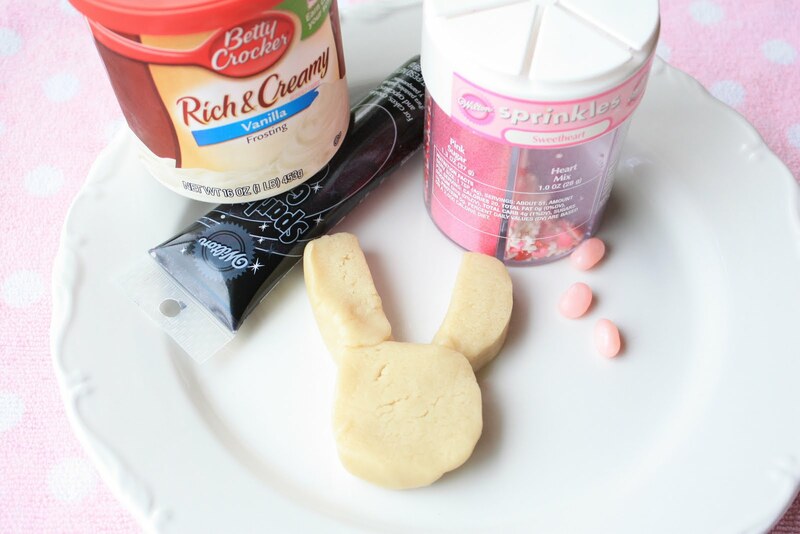 To make 1 rabbit cookie, place 1 whole slice on ungreased cookie sheet for head; place 2 halves on top, slightly overlapping on whole slice, for ears. Repeat to make 7 more rabbit cookies, placing 2 inches apart. Bake 7 to 9 minutes or until edges are light golden brown. Cool 1 minute; remove from cookie sheet to cooling rack. Cool completely, about 15 minutes. Frost cookies with frosting; decorate with icing and candies. 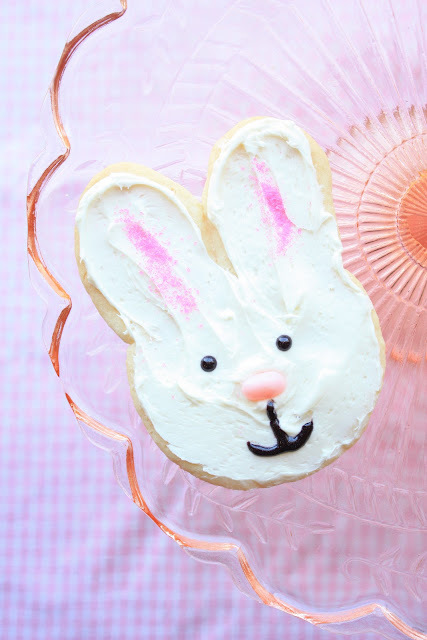 This is my kind of cookie; nothing too hard, and so cute. Once again, you're a genius! These are great! OH so cute. I'm loving these for not having to use a cookie cutter! So cute! My niece will love these! These are so sweet! The pink sugar dusting in the ears is such a clever idea! So cute and super easy. Great idea. I am going to make these with my daughter tomorrow! Very easy for a 4 year olf to help with. Thank you for sharing! Saw this on sweets for a saturday -- so cute! these are so cute. how do you get the eyes so perfect? might seem like a silly question...but i can never get gel/icing eyes to come out perfectly round like that? That is the cutest cookie! Love that sweet face! So cute and it doesn't get much easier than that. Way easy peasy! I love the cute shape. I just saw the Easter Egg pops on Sweets for a Saturday, these two would be great together. This cookie looks so sweet...! A perfect idea for Easter! My 4 year old granddaughter will be here next week. Looks like the perfect project. Love your blog. What adorable cookies! Your "munchkins" must love it when you bake for them! These are adorable! The little pink jelly bean nose is so cute! Adorable and I love that they are so easy to make! Those cookies are a sweet work of art. Love it! Thanks for linking them up.